Self catering villa with 2 bedrooms, ideal for families and couples. Wisteria is a lovely villa approx 5 min walk from fabulous sandy beaches of St. George, and conveniently close to restaurants, cash point and shops. It has a small garden, private parking space and paved pathway entrance. Pool facilities are available 100m from the villa. The villa is ideally situated for sightseeing and exploring the island. Both bedrooms have fitted wardrobes, air-conditioning and French doors leading onto the tiled terrace, and into the garden, excellent for al fresco dining! The family bathroom has a bath with shower and marble top sink unit. The open plan living/kitchen area has a contemporary fitted kitchen with a dishwasher, washing machine, ceramic hob, oven, and fridge freezer, great for all your self catering needs. What do you have to use in the villa? A selection of Books, games, CDs, DVDs and a Playstation 2 with games including The Mega Quiz with 4 Buzz controllers. Transfer from the airport: Local taxis are available from outside the airport or we can also organise a private pick up for you, please ask for detials. Extras: A travel cot and high chair has been provided for you should you be travelling with young children. We have also provided a small fold up bed should you be looking to travel with 7 people and can accommodate up to 10 people with use of a villa next door Please ask for further detils. We recommend Elena’s Pool which is a small family run pool just around the corner from the villa (2 minute walk); it’s peaceful with beautiful gardens, children’s pool and snack bar with WIFI. On arrival you will receive a welcome basket. If you would like to make your stay extra special we can arrange a bottle of champagne for you. (Please ask for details, there will be a small charge) English-speaking representative on hand to answer any questions and to recommend places to eat, drink and visit. Beach towels are also provided for you. Villa Wisteria is exactly as described on the website. What it doesn't tell you is that it is spotlessly clean, as well equipped as my own kitchen and ideally situated for beaches, restaurants and shops. A car is not necessary, but if you want to cook at the villa the local supermarkets only stock a small amount of vegetables, and the butcher is a drive away. We didn't bother in the end because there were plenty of very reasonably priced restaurants within 5 minutes walk. Keith, the local 'rep' is a font of all knowledge. We arranged a transfer to and from the airport, and he was full of advice on where to eat and what to do. He arranged a car hire for us (the car was brought to the villa! ), as well as a taxi to an amazing restaurant in the mountains (which he also booked for us). The local beach is a 5 minute walk and along with all the sun loungers and umbrellas for hire you can jet ski, banana boat, parasail, windsurf etc etc. There is no need to go as far as Corfu town for a boat trip. Kostas can take you to Paxos and AntiPaxos for the day at a a reasonable price. This is the perfect place to stay in a quieter part of the island. The hospitality of the owners and their family, as well as all of the Greeks is astonishing. There are lots of restaurants, a safe sandy beach and things to do. If you want a night life then St George is probably not for you, but for those seeking a quieter, more laid back holiday then do consider this as your base. You won't be disappointed. Many thanks for taking the time to write a review. It's so pleasing to hear that you had a great stay! Hope to welcome you back in the future! 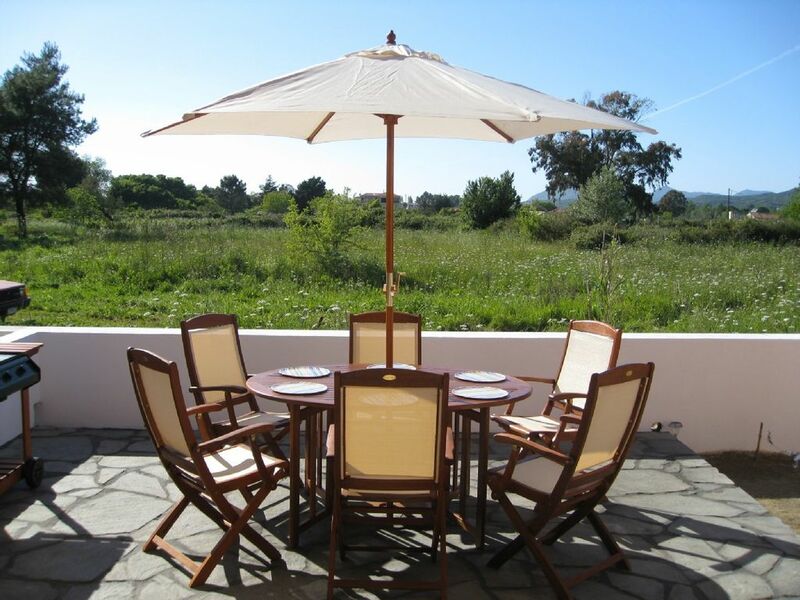 We booked this villa in Southern Corfu with the intention of having a very relaxed holiday away from the more "touristy" parts of Northern Corfu. I must say it was better than expected. It was a short walk to sandy beaches. Easy access to stores for essentials and Taverna's etc. But I think the best thing about this villa was Danielle's parents. They live in Corfu and were eager to offer local knowledge which made this holiday perfect. Whether it was where to shop, which Taverna's offer good food, which places to visit or rental car company recommendations we had access to first hand local knowledge. Thanks you lovely people ! I would definitely book with Danielle again. Cheers ! We had a really wonderful holiday. The villa is really perfect, everything clean and nice furniture in english style. Two little shops nearby. All restaurants in Agios Georgios offer cheap and delicious meals. Unfortunately the sea is not so clean as it was a lot of years ago. On Corfu, prepare yourselves to enjoy good food and wine, long lazy Taverna lunches, dip into the sea and enjoy complete relaxation. Yet those searching for a little more action will not be disappointed. Corfu is an island of diversity. Agios Georgios has two main beaches. Both beaches are wide, have easy-on-the-feet sand and are safely shallow for children. Sand dunes and a lake add interest to the north beach. There is also a wide variety of water sports available. The main stretch of St George offers many traditional tavernas, great for sampling some of the local cuisine and wonderful fresh fish!